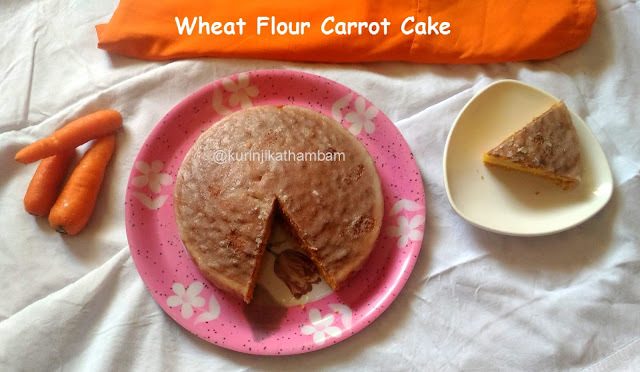 This carrot cake recipe is in continuation with carrot muffin (Recipe HERE) recipe I have posted earlier. The uniqueness of this recipe is that it is spicy as well, as we are adding cinnamon and nutmeg powders. Kids and adults both will love this blend. This carrot cake is also healthy as it is prepared with wheat flour and carrot. Click HERE to view more cake Recipes. 1. Sieve wheat flour, cinnamon powder, nutmeg powder and baking powder together twice or thrice. Keep it aside. 2. Powder the sugar using the dry mixi jar. 3. Beat the butter till it becomes fluffy using electric beater at high speed. 4. Then add the powdered sugar (from 3) and beat it continuously till they become fluffy. 5. Now add one egg and one tbsp of flour mixture (from 1) with the butter mixture. Beat the mixture till the egg mix well with the butter. 6. Now add the second egg and one tbsp of flour mixture (from 1) with the butter-egg mixture. Beat the mixture till the egg mix well with the butter. 7. Now add the essence with the butter–egg mixture. 8. Now add remaining sieved flour (from 1) little by little, beat them at low speed till they incorporate with the butter mixture. 9. Add grated carrot and beat them for 30 seconds only. Cake batter is ready. 10. Meanwhile, grease the 7 inch pan with butter and dust with flour. 11. Pour the cake batter (from 9) into the dusted pan. 12. Preheat the oven for 200 degree Celsius. Bake the cake for 30-40 mins or inserted tooth pick comes out clean at 180 degree Celsius. 13. Allow it to cool down completely. Remove the cake from the pan. Wow yummy and healthy Carrot Cake is ready to serve. 1. Should not add all the eggs at a time. Because the butter becomes curdle. 2. For eggless version, you can replace 2 eggs with 1/2 cup of curd. Can we make this cake without egg?? @PAvani: replace eggs with 1/2 cup curd. thanks. @Kalaa Shree : Thank you so much.